OnePlus is preparing to launch its second flagship smartphone of 2018, with the Chinese startup revealing a number of details about its next handset. So far, we already know the OnePlus 6T will include a fingerprint sensor embedded beneath the glass display, a smaller notch at the top of the screen, and it will jettison the 3.5mm headphone jack in favour of wireless and USB-C earbuds. However, a new leaked screenshot reveals the full list of accessories OnePlus plans to sell alongside its new flagship handset. Included in the accessory list is the price of the USB-C to 3.5mm headphone jack adapter needed to connect older wired earbuds to the new smartphone. According to a leaked price list published on technology blog MySmartPrice, the new adapter will set phone owners back €8.95, which is around £8 or $10.35. If the leak is accurate, that would make the OnePlus adapter one of the cheapest first-party solutions currently available on the market. Apple sells its Lightning to 3.5mm headphone jack adapter for £9 ($9), while Google offers a USB Type-C to 3.5mm dongle for £12 ($12) in its online store. OnePlus has already confirmed it will take a cue from rival manufacturers and include one free adapter in the box to help ease the transition away from 3.5mm. Regardless, it seems upgrading the rest of your audio equipment to be compatible with the OnePlus 6T shouldn't be as pricey as other handsets on the market – something we've come to expect from the OnePlus brand. The current-generation Bullet V2 headphones are available in White and Black colours, while the leaked listing suggests the next iteration will only ship in the latter. Elsewhere, OnePlus is widely-tipped to unveil a new generation of its £69 ($69) bluetooth-enabled Bullet Wireless headphones alongside the new OnePlus 6T. However, there are no clues about the future of the wireless headphones, which have magnets in the back of each earbud to stop them swinging uselessly around your neck when you're not listening to your favourite playlist, in this latest leak. When asked why OnePlus decided to ditch the headphone jack, co-founder Carl Pei told TechRadar that "making a great phone doesn't mean putting every component available into the device." He added: "You've got to make decisions that optimise the user experience, and understand that at times things that provide user value can also add friction." Now is right time to make the move, said Pei, as 59% of the OnePlus community already own wireless headphones – a figure that is steadily rising. 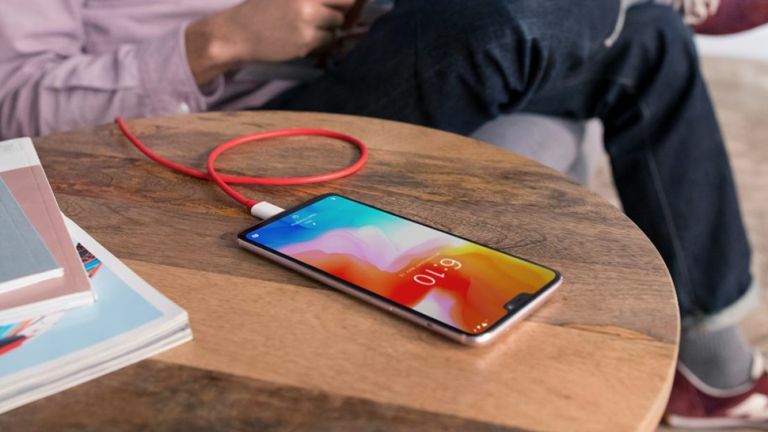 Dropping the port also frees up additional space inside the smartphone, which can be used to bring more battery life to the handset, something the OnePlus community has been requesting for the last few years, Carl Pei says. OnePlus looks set to offer a number of new cases for its OnePlus 6T smartphone, including protective shells made from wood and nylon. The Chinese firm's Sandstone finish, which features a tactile sandpaper-like texture, also looks set to make a return in a new case for the OnePlus 6T. The latest rumours suggest we'll find out exactly what the company has planned on October 17th, with the smartphone set to hit stores in the following weeks.